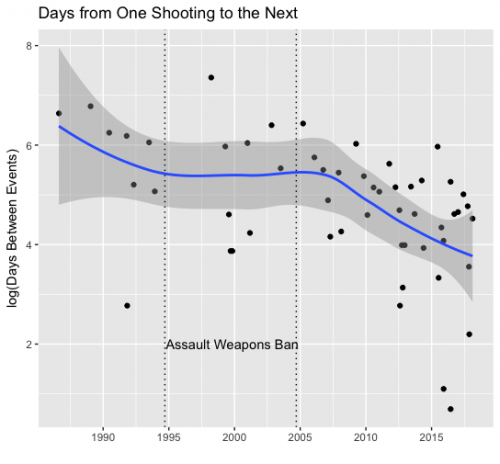 The number of days between mass shootings in the US over time. Interesting chart but it’s hard to disagree with his conclusion at the end of his post. 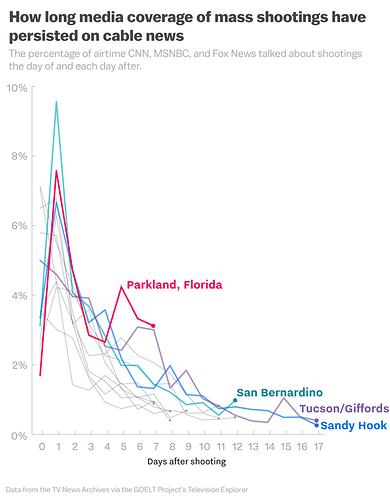 You could use that same graph and apply it to the now 24/7 news coverage, the more time the press spends covering these shootings the more shootings there are. Shooters are made into anti-heroes, Sales for the weapon involved sore as the news coverage becomes a week-long infomercial. Back in the 80’s and 90’s there was a growing trend at NFL games were some drunk fan would run onto the field delaying the game for several minutes, the fan would be seen on national TV and would have his 15 minutes of fame. This trend grew to a point that it became a part of every game. NFL took a number of measures to stop this but what had the greatest effect was the networks agreeing to not show the fan on TV, This took away the 15 minutes of fame incentive and now it is a very rare event for this to happen. what else those little dots do not tell us is how many of those shootings involved an AR15 style rifle, but one thing is certain, the more time the media spends talking about this weapon the more it will be used. That’s a tough one because unlike someone running around on the field in an NFL game, you can’t just not report a school shooting where people have died. Interesting chart that @TradingPanda, The frequency does seem to have gone up under O’Bama and since the Bankers screwed up the world’s economies - doesn’t it ? 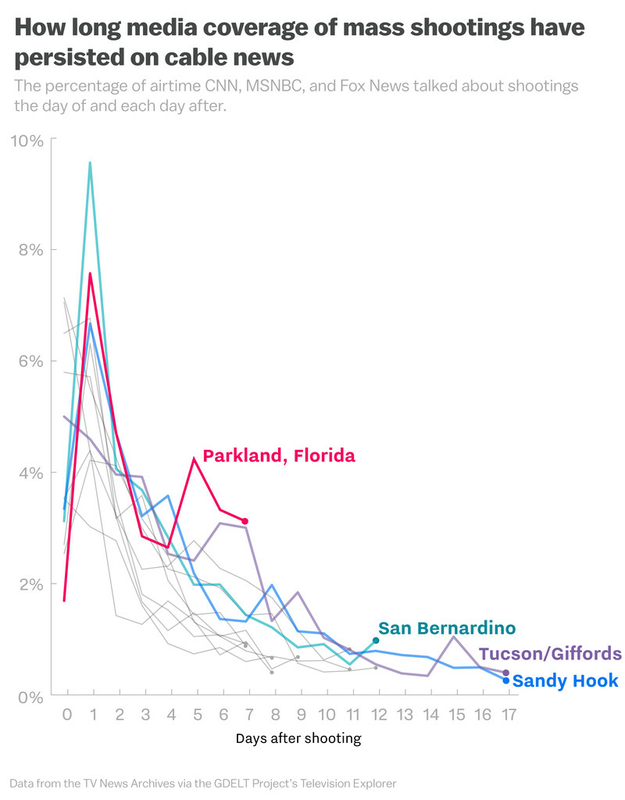 Here’s an interesting article from Vox on how teens seem to be successfully keeping media’s attention on gun control. 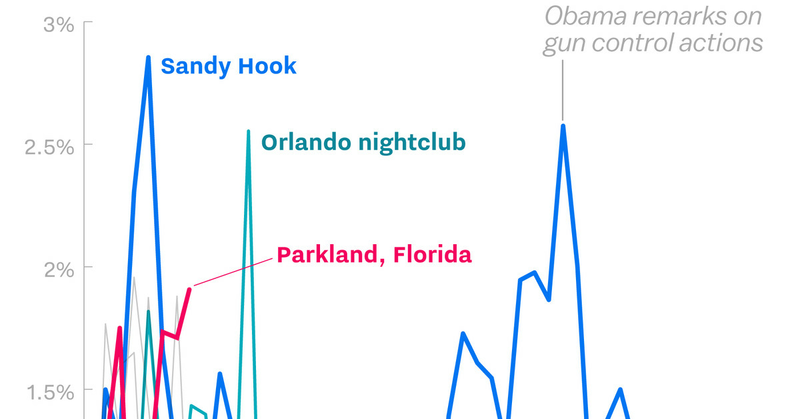 The data hints they are successfully keeping our attention on gun control. 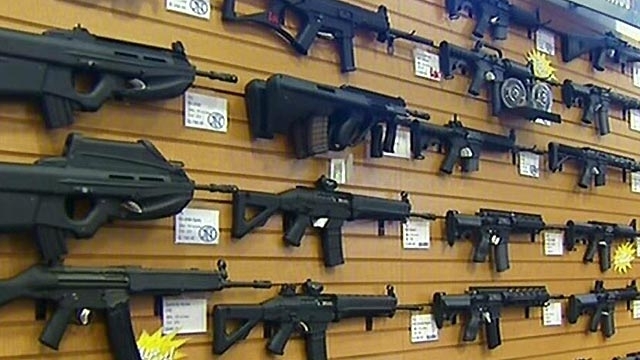 Reps. David Cicilline (D-R.I.) and Ted Deutch (D-Fla.) formally introduced a bill on Monday to ban assault weapons. secretly sold to the Mexican drug cartels under their Fast and Furious program. Impossible to know, for the simple and obvious reason that we don’t know how many mass shootings there would have been without the assault weapons ban. So we’d be comparing a known with an unknown. However, it’s possible from simple and reasonable common sense to envisage that if there hadn’t been the assault weapons ban, there might have been more mass shootings, and there’s no conceivable reason why there should have been fewer. All of which goes to show that sometimes common sense is quite helpful, when people try to fool you with phony statistical inferences. 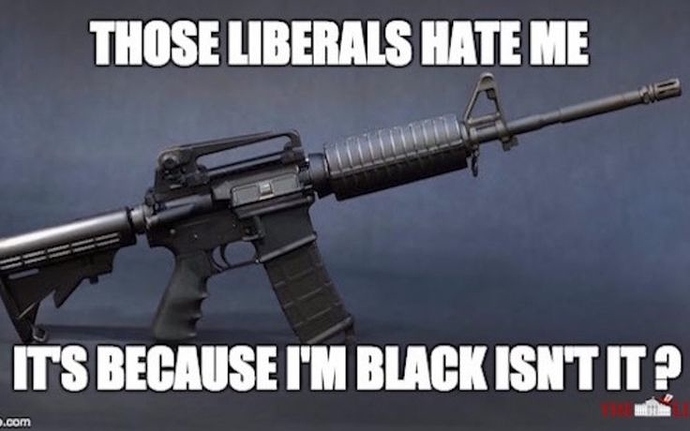 When ranting against “assault weapons” (which they can’t even define), liberals love to focus their hate on the AR-15. 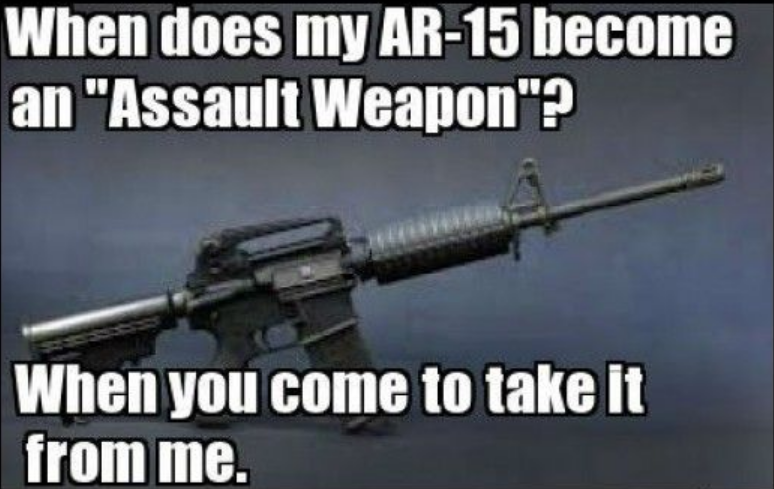 For two reasons: (1) it’s the most popular rifle in the hands of American civilians today, and (2) the liberals think AR stands for assault rifle. Stupid liberals. AR stands for ArmaLite Rifle – ArmaLite being the designer/manufacturer of the original rifle in the AR line. AR-15 simply means ArmaLite Rifle - Model 15. But, real facts are no fun for liberals. 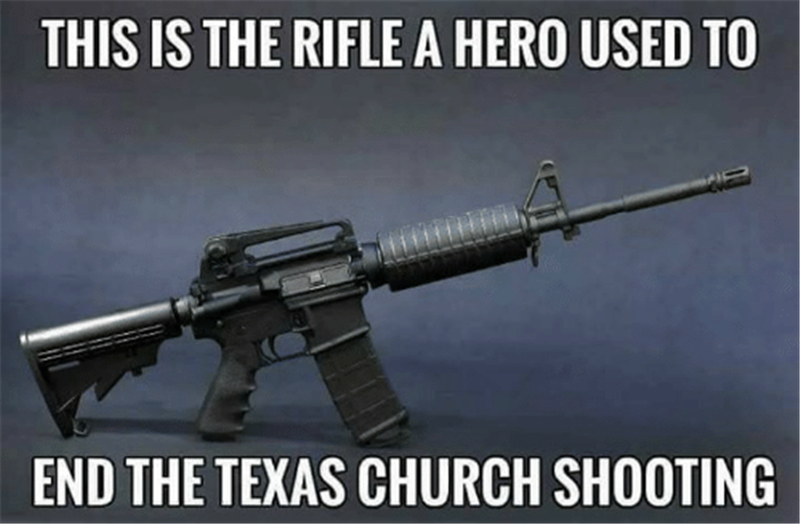 They prefer to believe AR-15 means Assault Rifle - 15-round magazine - good for shooting up schools, and other mass-killings. It has been reported that the armed Sheriff’s Deputy assigned to patrol and guard Marjory Stoneman Douglas High School in Parkland, Florida, stayed outside the school, taking cover behind the open door of his police cruiser, while the gunman was killing students inside the school. And today it was reported that, prior to the Parkland shooting, a total of 45 warnings went out to police and the FBI from the public, regarding the liklihood that Cruz (the Parkland shooter) was unstable and was prone to doing something like this. 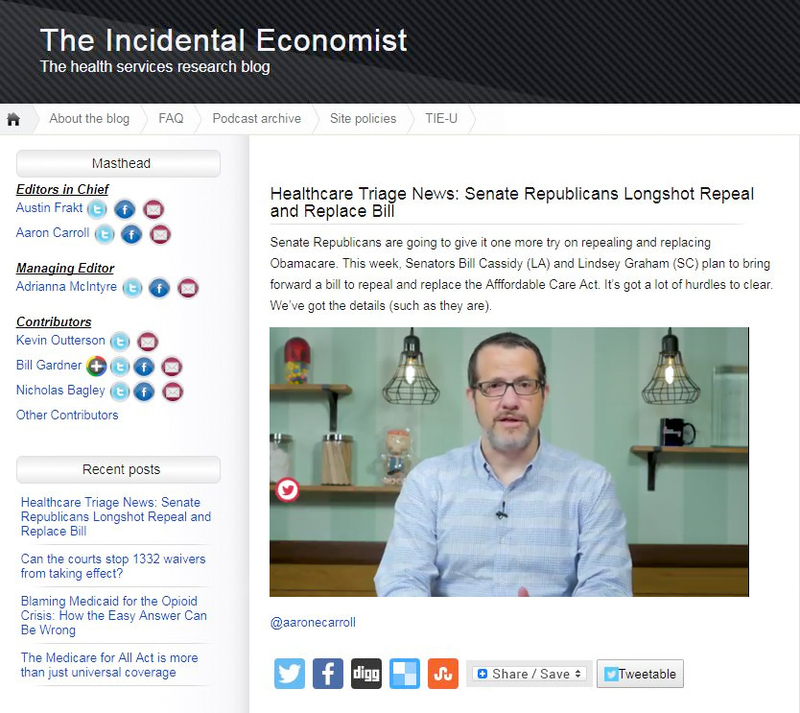 Forty-five warnings, all apparently ignored. Sounds interesting and I agree with your point to an extent, but how do you combine that with the clear public interest to inform us of these incidents. I am based in the UK and this all seems crazy to me. I am based in the UK and this all seems crazy to me. No crazier than the Manchester Arena bombing that killed 22 and wounded 500, Strange how you guys make peace with the IRA, then start importing people to continue the bombing. What. U must be kidding. No equivalency whatsoever in terms of frequency and “we” aren’t selling military grade hardware to would be jihadists. And I don’t think it even matters if that were valid, that’s like saying just because my house is on fire and I haven’t called the fire brigade then you won’t either when your house is burning. That was long winded; basically two wrongs. But I guess that might be a natural reaction to the perceived indictment against the cultural norms of a group that you belong to. It was not intended that way, and I think we would agree that the objective here is to curb the spate of gun crimes, in the UK, the USA or anywhere else for that matter, the question is how. From a low gun ownership country point of view it seem obvious; get the guns off the streets. ropunzel, I would argue that both our countries are engaged in military actions that serve no national defense and on the domestic front an immigration policy that does not serve the best interest of their citizens. On the question of guns, I would argue that is a side issue, be it guns, knives, bombs or trucks, Both our countries have experienced people that have no problem killing. The question we should be asking is why. what is different about today than 50 years ago when these killings were far less frequent. In any case, I do apologize for any offense my earlier posting may have caused. I guess Americans really don’t like it when someone tries to take their rights away. “we” aren’t selling military grade hardware to would be jihadists. Not directly, but “you’re” clearly selling military-grade hardware en masse to Saudi Arabia, and some of it ends up in the hands of jihadists. Does that make “you” part of the solution, or part of the problem? Mate WE (uk) have been great in the past ! We were the main proponents of the Slave trade, The OPium (to China) trade. We had “Ofiicially approved” Pirates and stole land all over the place (India, Canada, America, Most of AFrica, Australia, New Zealand, etc etc ) - so a little Gun-Running is actually very modest in historical terms !